Ninako confesses her love to Ren. But get rejected because he is already have a girlfriend. They promise to stay as a friend. Some other guy confess their love to her but she rejects them. Is it because she still wants to be with Ren? A young teacher is given the toughest classroom in the school. Based on the TV series. Stylish yet simplified spy movie. 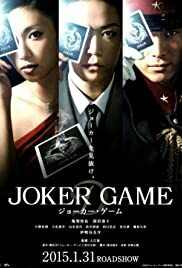 While Joker Game has good atmosphere and to its credit, an engaging first act, it eventually culminates into basic espionage thriller with little twist or surprise. It's not entirely a complex showing of strategy as most of the time it focuses on flamboyant one dimensional characters. Still, its simple sleight of hand might adequately entertaining as mild diversion. After an incident with his military supervisor, a man is sentenced to death and eventually recruited to a spy agency. He's given alias Jiro Kato after intensive training and sent to recover a crucial piece of information. It starts with a good opening act before, unfortunately, turns into a predictably straightforward plot. The entirety of the cast is shaped to be a glorified version of espionage with excessively classy demeanor. It's appealing at first, but ultimately the feeling wears out as it hampers with the thriller aspect, even making it look rather comical later on. Characterization, along with acting, serves to create larger than life personas, and the characters seem trapped in this constant superficial front. It plays around with typical heist set-up as well as slight bantering with femme fatale. This is not a deep display of intelligence or overlaying trickery. There are only few nifty gimmicks at best, and at later act it changes into basic cat-and-mouse game in outlandish setting. Few of these instances even resemble classic Bond flicks, although it can get too cheesy, especially the action sequences which look like watered down Pirate of Caribbean debacle. It may win a few style points with the visual and premise, but as far as thriller goes, Joker Game is just elementary.